CaDeN Winter Newsletter: 2016 Annual Report, new scientific articles, Twitter launched, attend Expo Déprescription and Johanna Trimble is volunteer champion! The Canadian Deprescribing Network (CaDeN) had a very busy fall and beginning of winter. 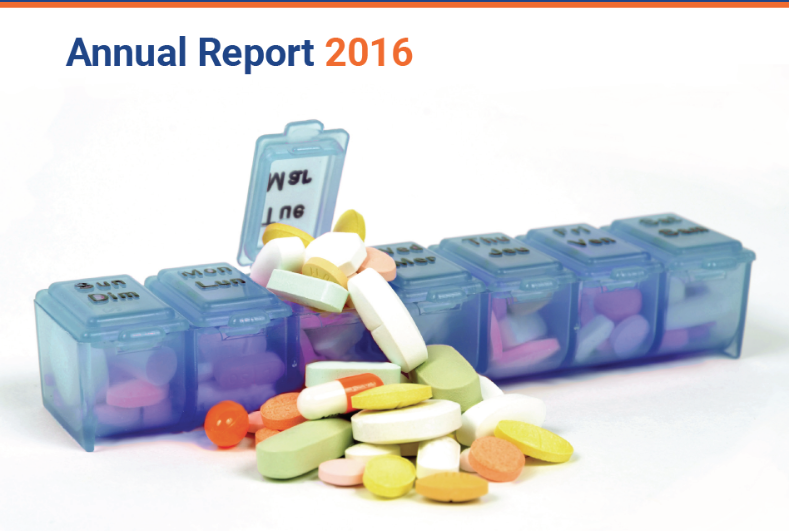 We just released our first Annual Report, new scientific articles on deprescribing have been published and stay tuned for news about events we're planning next spring. In this winter newsletter, we share all the important deprescribing news and updates. If your colleagues haven't subscribed to the newsletter yet, they can click here. We're proud to have released our first Annual Report, now available in English and French on our website. A special thank you to our partners and collaborators for their dedication and hard work in the last year for the launch of CaDeN. Many thanks to our committee members that have advised The Network since its inception. Your invaluable support has been crucial to the sucess of our first year. Join us on the morning of Wednesday, April 26th, 2017, for Expo Déprescription at the l’Institut universitaire de gériatrie de Montréal. This bilingual free event is open to the public. All are welcome! This is a unique opportunity to learn about the history of prescription medications, and especially those that are now considered to be inappropriate. There will be several pavilions offering information, resources and tips concerning the sound management of medication. Questions? Contact Isabelle Reid. Want to improve antipsychotic use? 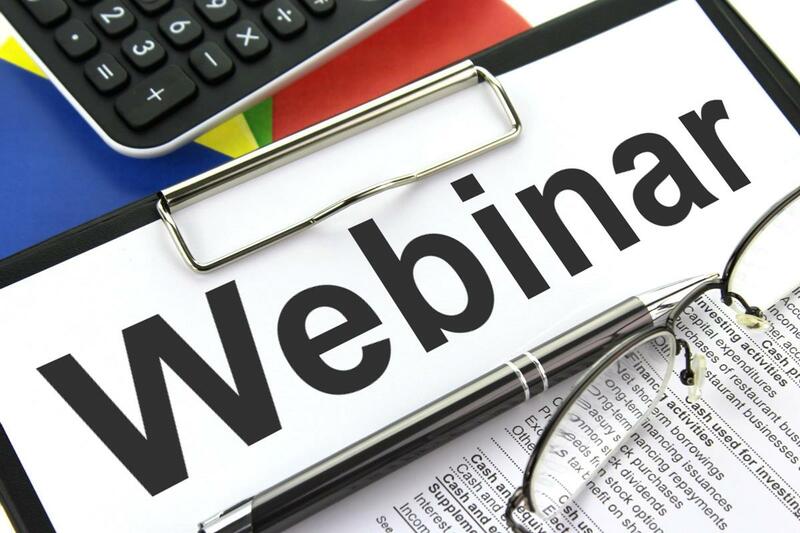 The Canadian Foundation for Healthcare Improvement has invited Dr. Justin Turner, Assistant Director of CaDeN, Dr. Wendy Levinson, Chair of Choosing Wisely Canada and Dr. Dennis Cleaver, Executive Director, Seniors Health Strategic Clinical Network of Alberta Health Services, for a live webinar on February 8th (12 - 1 pm) entitled: Tools & Resources to Improve Prescribing – Canadian and International Perspectives. Click here for more information or to join the conversation! 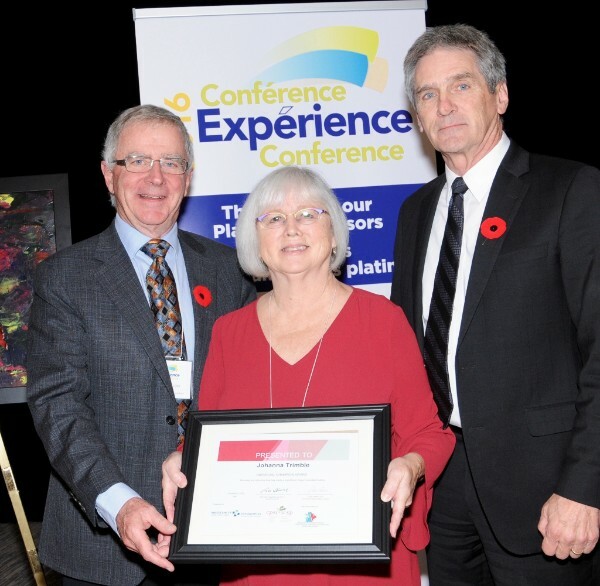 Congratulations to Johanna Trimble who was recently awarded the Volunteer Champion Award for her work with the Community Engagement Advisory Network in British Columbia. This award recognizes a volunteer who, through exemplary dedication and service, contributed to a project or initiative that resulted in identifiable improvement in patient safety outcomes. Want to know what's trending in the world of #deprescribing? 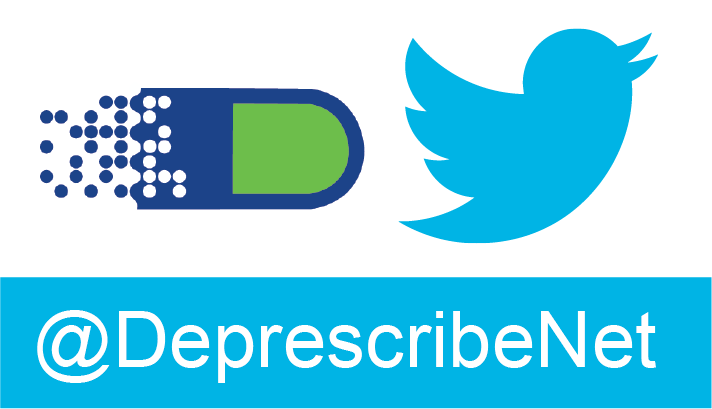 We've launched the Twitter account @DeprescribeNet with a broad scope to engage patients and the public in conversations about deprescribing inappropriate medications. We've been posting almost daily news articles, publications and important info! Follow us to stay up to date. Facebook coming soon. Members of CaDeN describe The Network's practical, comprehensive, ecological approach to optimize medication use through coordinated action across Canada’s health system. Philippe Martin and Cara Tannenbaum show that the EMPOWER brochure is effective for reducing benzodiazepine prescriptions in community-dwelling older adults with mild cognitive impairment. Barb Farrell and colleagues show that evidence-based deprescribing guidelines increase clinicians' self-efficacy in developing and implementing a deprescribing plan for specific drug classes. Some of our CaDeN members provided info for this new report, which examines the problem and consequences of unsafe and inappropriate use of prescription drugs by seniors and possible solutions. Think sedative-hypnotic use is only problematic among elderly? Think again: Dr. Steve Morgan and colleagues examined sedative-hypnotic use in British Columbia and found that half of long-term users are under 65 years of age. Emily Reeve, Barb Farrell and Wade Thompson provide an overview on deprescribing and offer practical recommendations of when and how to deprescribe. CaDeN member Emily Reeve and colleagues develop and validate a questionnaire to capture older adults’ and caregivers’ beliefs and attitudes towards deprescribing. A themed journal issue on deprescribing: The European Journal of Hospital Pharmacy has dedicated its entire January 2017 issue to deprescribing. There is an incredible range of papers within. Check it out here and listen to their special podcast. Deprescribing to Reduce Medication Use: Will This Help Your Patient? A US physician describes his New Year's resolution to deprescribe and provides advice to doctors and patients. This podcast tackles the question "when does deprescribing make sense? ", and a panel of experts answer questions from listeners. They also refer to our website deprescribing.org for more information on deprescribing. Taking multiple medications? You may also be taking excess risks. This article highlights the risks of polypharmacy, tips for patients on medication reviews and the right questions to ask their doctor about medications. The Government is offering $544 million over 5 years for prescribing initiatives and $6 billion for home care. Cara Tannenbaum is interviewed in this feature article suggesting 10 strategies for a good night's sleep. Do women ever respond differently than men to prescription drugs? Cara Tannenbaum responds to questions about women, medication and side effects in this article. CaDeN member and researcher Emily Reeves outlines 10 key points for deprescribing and outlines the deprescribing process. American geriatricians answer pertinent questions about deprescribing. One-third of long-term users say they’re hooked onprescription opioids. Use MedStopper to decide if medications should be stopped or changed. See the deprescribing campaign on the National Pensioners Federation website. CaDeN is a group of clinicians, researchers, patients and patient advocates with an interest in promoting appropriate medication use across Canada. CaDeN is committed to reducing the use of inappropriate medications by Canadian men and women over the age of 65 by 50% by 2020. Copyright © 2017 Institut universitaire de gériatrie de Montréal, All rights reserved.